Home » Economy » Fire-risk fridges still on sale in UK, says Which? Hundreds of potentially dangerous fridges, freezers and fridge-freezers with plastic backings are still on sale at UK retailers despite them being shown to pose a fire risk, a consumer group has said. Tests by Which? have found that the plastic backing used on some fridges and freezers can be highly flammable and, in the event of a domestic fire, can accelerate the spread of flames. Which? is calling on retailers including AO.Com, Argos and Currys PC World to remove such white goods from sale as a matter of urgency. Last year it published a list of “don’t buy” models, which included some from manufacturers including AEG, Kenwood, Hotpoint, Smeg, Candy, Hotpoint, Zanussi, Indesit, Whirlpool, Hoover, Bush and Ikea. The London Fire Brigade (LFB) and the charity Electrical Safety First have also warned about the dangers of flammable plastic backing. An electrical fire expert stated in a report for the Grenfell Tower inquiry – where the blaze involved a Whirlpool Hotpoint fridge-freezer – that plastic casing was combustible and could contribute to the spread of a fire. Which? 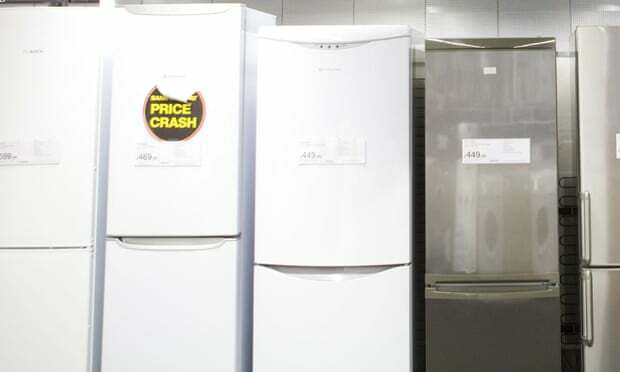 investigated how many such products were on sale across AO.com, Argos, Currys PC World and John Lewis – the four largest retailers for this type of appliance. “We’ve repeatedly asked manufacturers and retailers to stop making and selling these potentially unsafe products, which could put people’s lives at risk,” said Alex Neill, the managing director of Which? home and product services. “It’s a big win for consumers that some manufacturers and retailers have acted, but some are still dragging their feet. Which? believes the safety tests that products must undergo are not fit for purpose. It has called for a more rigorous standard to be introducedand for appliances to be made with a backing of non-flammable material. But it does not expect to see this come into force for several more months. Which? found that on 21 January AO.com’s website displayed 173 plastic-backed models, Argos 137, Currys PC World 56 and John Lewis & Partners three. All four retailers said they now had fewer plastic-backed products on their websites than they did on 21 January. Some of the retailers said this was down to the fact that products listed on their own websites were incorrectly listed as plastic when they were actually metal-backed. However, even with updated listings, it is estimated there are still between 148 and 241 plastic-backed products available, with the largest number on sale at AO. After being approached with the results, AO committed to stop selling the potentially unsafe models by July. Currys PC World and Argos did not commit to a date for removal from sale.